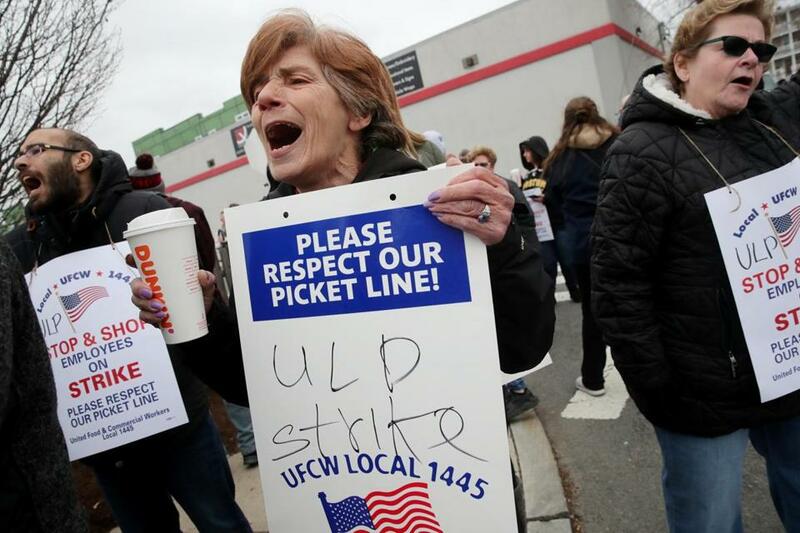 Stop & Shop worker Lynda Insogna, center, joined in a chant on the picket line at the Stop & Shop in Somerville on April 12. Minutes before Stop & Shop workers walked off the job Thursday afternoon, Kristen Johnson was slicing cold cuts at the Somerville store and discussing her union’s contract dispute with a customer. When the strike was announced, Johnson said, the customer put her groceries in her car and went back to stand with the workers on the picket line. It wasn’t unexpected. Johnson said that even before the strike, a number of the regular shoppers at the Somerville store had pledged not to cross a picket line. With 31,000 members of the United Food & Commercial Workers on strike at 240 Stop & Shop stores in three states, the big question facing both union and management is: Will more shoppers stay away? There are a lot of options for grocery shoppers: Market Basket, Shaw’s, Star Market, Wegmans, Whole Foods, Roche Bros., Walmart, Target, and Costco, among others. But there aren’t options everywhere, especially on Nantucket, where the only supermarkets are a Stop & Shop — and another Stop & Shop. And some shoppers can’t, or won’t, change their ways. Stop & Shop worker Lizette Rivas, joined in a chant on the picket line at the Stop & Shop in Somerville on April 12. More customers may be willing to honor a picket line now than just a few years ago, in part because of growing public support for unions, and a number of high-profile strikes in other industries that have boosted awareness of working conditions and wages. 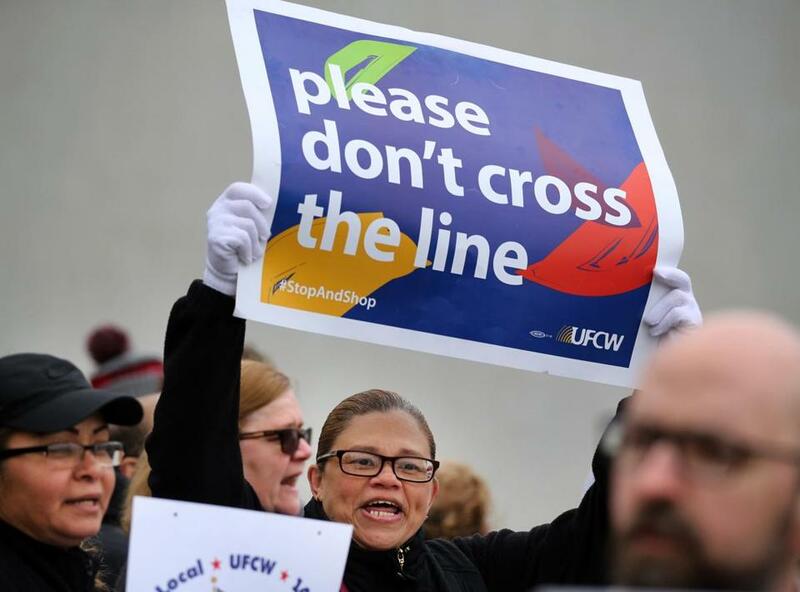 “If it was two years ago, the UFCW would be in trouble,” said Tom Juravich, a labor studies professor at the University of Massachusetts Amherst. That was before strikes by public school teachers in multiple states, before the strike by workers at Marriott hotels in eight cities, including Boston, and before the lockout by National Grid in Massachusetts that kept 1,250 local gas workers out of work for six months. In 2018, there were 20 work stoppages involving 485,000 people around the country, the highest number since 1986, the US Bureau of Labor Statistics reported. Stop & Shop and the union workers are fighting over the company’s proposal to increase health care costs and reduce pension contributions for new hires. The company has also talked about eliminating Sunday overtime pay. Paul Tritto, an assistant meat manager at the Somerville store who has worked for Stop & Shop since 2001, said these benefit changes would cut $350 out of his weekly paycheck. “That’s like a part-time job,” he said. Stop & Shop said that it is offering pay raises and increased pension contributions for current employees and that employee health care costs would still be much lower than what workers at other retailers pay. A number of stores closed for several hours Thursday after the strike began. Stop & Shop said the majority of its stores in New England were open Friday, and all the pharmacies and banks inside them would be operating regardless of whether the store was open. Stop & Shop stores in New York and New Jersey were not affected by the strike. The company, owned by Netherlands-based Ahold Delhaize, made $2 billion in profits last year. But it is facing enormous competition from nonunion grocers with lower labor and operating costs, said Burt P. Flickinger III, managing director of the New York retail consultancy Strategic Resource Group. 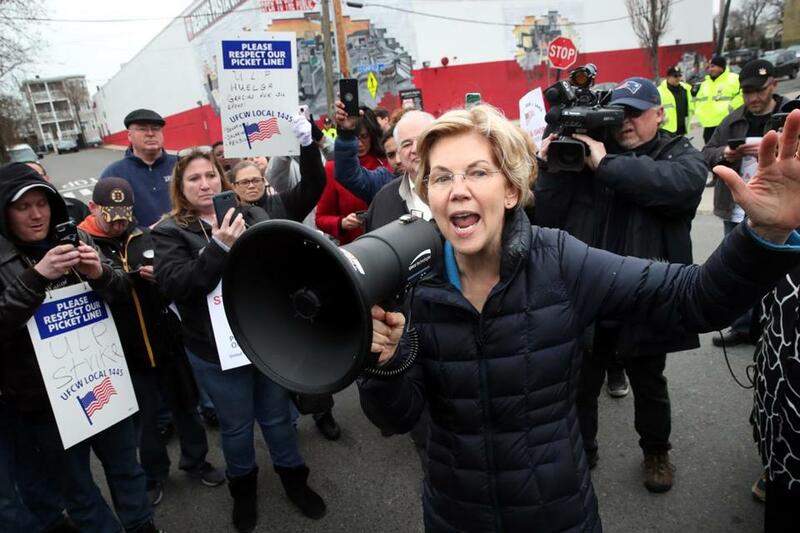 Senator Elizabeth Warren addressed Stop & Shop workers on the picket line at the Stop & Shop in Somerville on April 12. The Somerville store was neither empty nor busy Friday, as a steady trickle of customers crossed the line. One was Lars Janer of Cambridge, who said he had no idea there was a strike, in part because the picket line had been moved temporarily to a side street to accommodate Warren’s visit. Janer, a fiction writer who came to get ingredients to make spicy chicken wraps, also didn’t see the signs announcing limited service and hours. But he did notice that inside, the only open cashier lanes were self-checkout, “which I hate.” In the future, he vowed, he’ll shop at Trader Joe’s or Star Market. “I’m definitely pro-labor, pro-unions,” he said. Laura Watson knew what she was walking into, but she had a barbecue to host and an 8-month-old to take care of, and knew she couldn’t get what she needed at Whole Foods in Charlestown, where she lives. 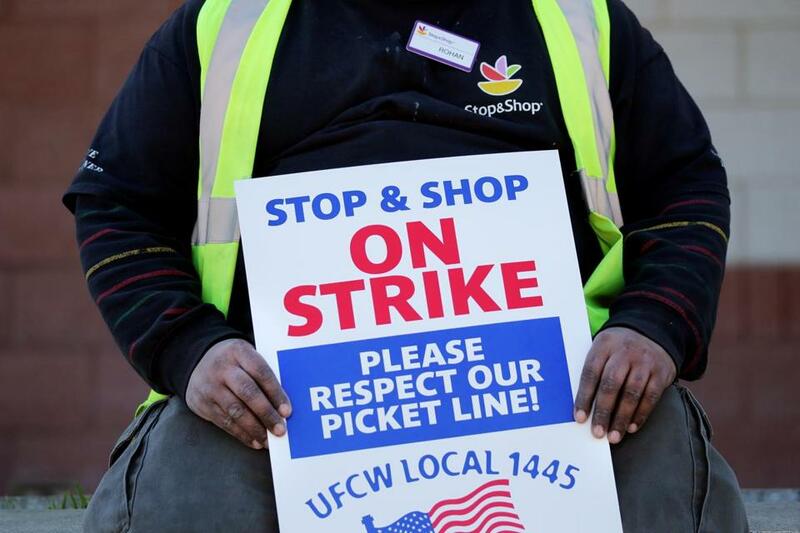 Stop & Shop employee Rohan Balbour held a strike placard outside the the Stop & Shop on Freeport St. in Dorchester on April 11. The number of Americans in labor unions has dropped significantly over the years, with fewer than 11 percent of US workers in unions, compared to more than 20 percent in 1983. But support is at a 15-year high, according to a Gallup poll in August, with 62 percent of Americans voicing support for unions. Public opinion is an increasingly important tool for unions, especially as social media posts, often from the workers themselves, fans the flames of discontent. “The spectacle of the strike is as important strategically as the economic impact of the strike,” said Carlos Aramayo, financial secretary treasurer of Unite Here Local 26, whose workers went out on strike at seven Marriotts in Boston last fall. Still, for some, the spectacle is not enough. “I’m not going to go shop at Wegmans and pay double the price,” said Morgan Nattrass, a recent college graduate who crossed the picket line at the Somerville Stop & Shop Friday even though she was yelled at by strikers for shopping there the day before.